Visit the grocery store less often and make your shopping more strategic when you go. Like it or not, buying groceries is a part of life. But paying top dollar for your weekly supermarket trip doesn’t have to be a given. If you’re feeling sticker shock at the store, here’s how to save money on groceries. Some shoppers head to the grocery store without taking inventory of what they already have at home. Before you buy one too many loaves of bread or gallons of milk, check your refrigerator and pantry. Snap a picture of what you already have or make a list of what you know you’ll need. It helps to limit your trips to the store, too, according to Steve and Annette Economides of MoneySmartFamily.com. The less you’re physically at the store, the couple says, the fewer opportunities you have for impulse purchases. Subscribing to the Sunday paper is worth your investment, says Kurt Jetta, CEO and founder of retail and consumer analytics firm TABS Analytics. He says paper circulars are rife with grocery deals like buy one, get one free. Look in the paper for coupons that apply to the items you know you’ll be buying. But be leery of promotions that have too many conditions or are difficult to redeem, Jetta says. Offers like buy one, get one half off seem worthwhile, but they could encourage you to spend more to get two of a given product when you need only one. 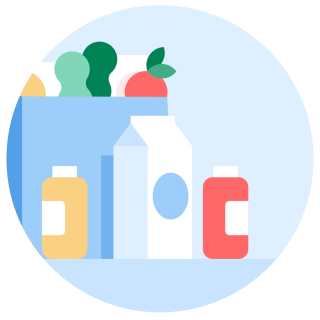 Online grocery services and subscriptions are convenient, but they can also be costly. Jetta warns that you may not always find the size you’re looking for online and could be forced to trade up to a bigger size for a higher price. Additionally, some grocery orders at Amazon are fulfilled by third-party sellers. These could carry shipping costs, which add to your bill. If eggs are on sale and you buy more than you can eat before the expiration date, you’ll end up overspending. Your burn rate refers to how frequently you use up products, say Steve and Annette Economides. They recommend figuring out how long certain products last you, then stocking up on deals accordingly. If you have room in your freezer to buy a few extra sale-priced chickens, go for it. But if eggs are on sale and you buy more than you can eat before the expiration date, you’ll end up overspending. You probably already have a favorite potato chip or a top pick in laundry detergent, so use your brand loyalty to your advantage. Follow your favorite brands on social media or sign up for their mailing lists. Tide laundry detergent deals and offers are sent directly to the inboxes of email subscribers. But just because you like Tide doesn’t mean you shouldn’t be open to trying something else. For some products you can do without the brand name altogether. Jetta says “value” labels are a more affordable alternative to premium brands. For instance, if you’re indifferent about the hair product you use, you may try out Suave shampoo instead of Pantene. We found a 30-ounce Suave shampoo for $1.89 online at Target, while a 12.6-ounce Pantene bottle costs $3.49. 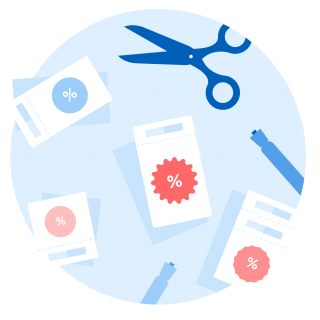 Split your purchases across multiple stores to pinpoint the best deals at each. But if you patronize the same supermarket regularly for convenience, join the store’s rewards program. Depending on the program, input your rewards information (usually your phone number) at checkout to earn points on your purchases — which can be redeemed on future visits. Wholesale clubs sell food in bulk at low costs per unit, which is especially appealing for large families. Consider buying a membership at a store such as Costco, Sam’s Club or BJ’s Wholesale Club if you have room to store large amounts of food, or if you want to stock up on nonperishable necessities like paper towels and toilet paper. Be prepared to spend more at the outset as you invest in large quantities. And remember, you’ll have to pay an annual fee for the warehouse membership. Before you commit, ensure that you’ll shop there enough to save more on your groceries than you invest in the membership. Take note of how much you’re getting for your money. The price per unit (ounce, pound, gram, etc.) of different packages is often printed on the pricing display near the product. You also can use a unit price calculator to determine the cost per unit. The information is helpful since some stores sell identical products in different sizes. Prices can fluctuate within the same store, too. Jetta says produce that’s in season is less expensive since out-of-season fruits and veggies could have additional costs tacked on. Holidays like Christmas, Easter, Valentine’s Day and Halloween are known for their candy sales. If you want to snag a bargain, shop the clearance section after the holidays are over. Stores will deeply discount their seasonal merchandise, and you can stock up for a low price. Jetta has an insider tip for consumers who make one large shopping trip per month — go to the supermarket early. “At many retailers, there are usually better deals the first week of the month,” he says. Jetta notes this phenomenon is a byproduct of the paycheck cycle; stores are likely to compete for traffic when they know their customers have just gotten paid. Track your spending and find ways to save.